It was everywhere this past weekend. In my mailbox. In a magazine. Even on TV. 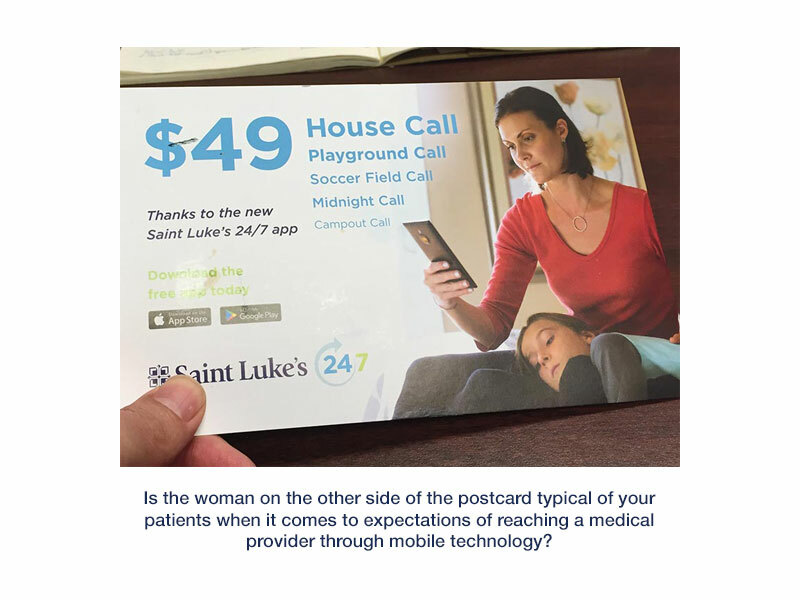 One of the local hospital systems here in Kansas City is blitzing the market with news of their “24/7” app. And doing it well, I might add. Download the app for free. And for just $49 per virtual visit, you can connect to a doctor who will diagnose, recommend treatment, and prescribe medication. “Treating all ages for everything from pink eye to poison ivy,” the postcard says. So why does this matter to physical therapists? There’s a good chance your patients are already part of the mobile generation. In fact, studies show about 75% of US adults own a smartphone. They rely on their devices for instant access to their bank accounts, weather forecasts, social interactions, and dozens of other activities. And now with apps like the one from our local hospital system, more and more people will expect to receive direct access to medical care and their medical providers. Unless you have purposely avoided it, you’ve probably heard the terms telehealth, telemedicine, telecare, telerehab and perhaps a few others in recent months. The exact definitions of these terms vary from resource to resource. However, the common theme is this: More and more care providers are treating patients remotely via technology regardless of what you want to call it. While it seems a simple enough concept, bringing a remote care or tele-whatever system on board at your practice may seem like an intimidating option in reality. After all, your practice likely has limited resources and even less free time to investigate such a solution. However, in the name of improving patient care, there are plenty of signs that now is the time to map a strategy for extending your practice into the mobile space. What should you look for in a mobile strategy solution? When you decide to take the tele-plunge, you will want to be sure to evaluate any solution for a few basic elements. Does the system offer HIPAA-compliant communication between therapist and patient? Is any data that is stored secured and encrypted? Does the vendor of the system demonstrate an understanding of HIPAA and PHI (Protected Health Information) through provided statements and policies? If the solution you’re evaluating can’t positively answer these questions, then find one that can. This real-time method relies on a combination of technical equipment (computers, smartphones, cameras, bandwidth, speakers/microphones, etc.) to be functioning on both the patient’s and the provider’s end. Otherwise, the video and/or audio will not be of high enough quality to deliver care. Live communication also requires some level of scheduling as both parties must be present for it to work. So, the live communication method may be an ideal solution when asking a family doctor about pink eye or poison ivy as in the case with the 24/7 app. But insurance and other issues notwithstanding, could it ever be used by a physical therapist to determine a plan of care without seeing the patient in person? Or is it a system used only to “check in” on the patient when at home? In the end, is it worth the investment in time, scheduling, and equipment to invest in a system that performs live communication securely (see point 1)? That’s something you will have to evaluate for your clinic. Asynchronous systems, meanwhile, rely on securely stored data that is accessed by providers and patients in an on-demand basis. The technical requirements (mostly computers, smartphones, and bandwidth) are typically a little more forgiving with this approach than with live connections and security is generally much easier to accomplish. Let’s imagine a physical therapy example with an asynchronous system. A PT uses a tablet or laptop to build a video-based home exercise program complete with instructions from the tools provided by the system. The patient then accesses the workout at their convenience from home through a secure app. Patients provide feedback and messages (texts, videos, or audio messages) that the system stores. Either system has its benefits in connecting physical therapists and patients when they are at home between sessions. Which one better suits your physical therapy practice’s staff? Most telehealth/telemedicine systems or home exercise programs have features that will enable you to build workouts and/or communicate (text and/or email) with patients at home. But is the solution you’re evaluating designed with enough flexibility to keep you in total charge of the patient’s care and also have enough features to keep the patient engaged? What happens when you have treatments that fall outside the scope of the software’s offerings? Can you provide your own exercises? Can you modify instructions to fit specific patients? Are you able to monitor a patient’s exercise compliance automatically? Or do you just have to settle for what the system offers? Try not to be limited for technical reasons. Be sure you choose a solution that is able to deliver all your physical therapy expertise from your desktop to the patient at home. And be sure the patient is comfortable accessing the system and finds value in the solution that is offered to them. So are you ready to get going on a mobile strategy? This article is based on observations from our 2+ years of development with the In Hand Health system and input from physical therapists. If you’re ready to investigate a mobile treatment solution for your PT practice, we have an offer for you. Right now, you can put our thoughts to the test and try our system for free. No credit card required. Try 25 patients for free to see how the system works. You don’t even need to contact us (unless you want to of course). Just complete a short form that will establish your clinic’s account in our system. You will get an email soon after that will show you the first steps to get going from there. Your only investment is the short time required to learn any new system. Most clinics are adding patients, sending and monitoring video-based workouts, and securely communicating with patients within a day. Two if you’re busy. So visit www.inhandhealth.com/signup/clinic/ to get started on your mobile strategy today. Let us know if we can help at info@inhandhealth.com. 1 Read this article for more information on the asynchronous video study for physical therapy.